Thistles are members of the sunflower family. The plant typically grows at elevations between 5000 - 9000 feet along roadsides and in fields. 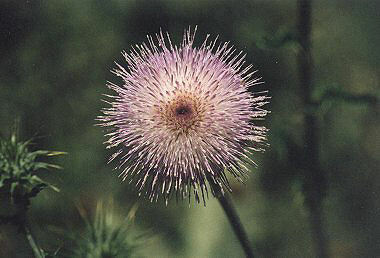 The Nodding Thistle grows to about 3 feet in height and has green, lobed leaves which grow to 8 inches in length. Nodding Thistles are not native to the Sonoran desert. They originated in Europe, though they may now be found in certain areas of the US. The plant blooms between June and October and produces a round pink to lavender flowerhead which is surrounded by a series of spiny bracts.